If you read this blog through a reader, stop by the page to check out the new header! 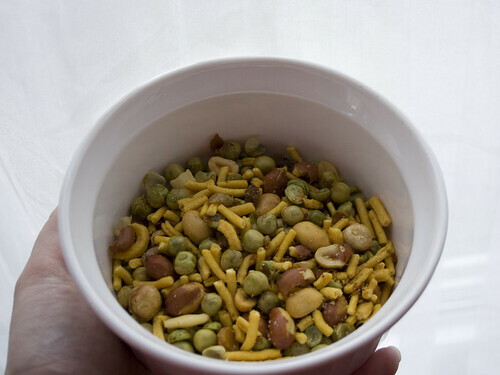 I first discovered Bhuja snacks at the Gluten Free Cooking Spree last year and I loved them. Recently I received a bag of each of the four varieties for reviewing. I've so far only opened the cracker mix which is a mix of "crispy multigrain noodles, crunchy garden peas, peanuts and rice crackers with a savoury blend of aromatic spices." There are also raisins in the mix which add a nice sweetness because this mix is spicy! But it's not nearly as hot as the original mix, which I tried last year also. I love this stuff, it's a great alternative to chex mix. It goes great with a hard cider! It's Indian spicy, so if you aren't a fan of that kind of spice you might not like it, but I think it's great! I am looking forward to trying the fruit and nut mixes. 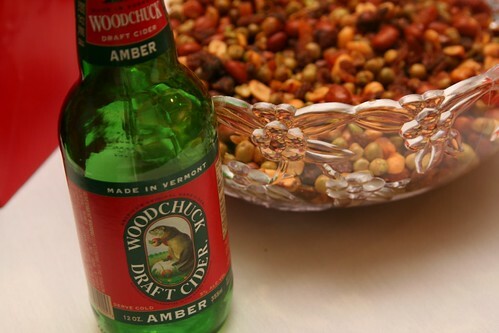 Kim - I love Woodchuck!! Adding my love for your new header! Nice header BTW! Did you design it? I heart bhuja snacks -- they are sooo tasty.